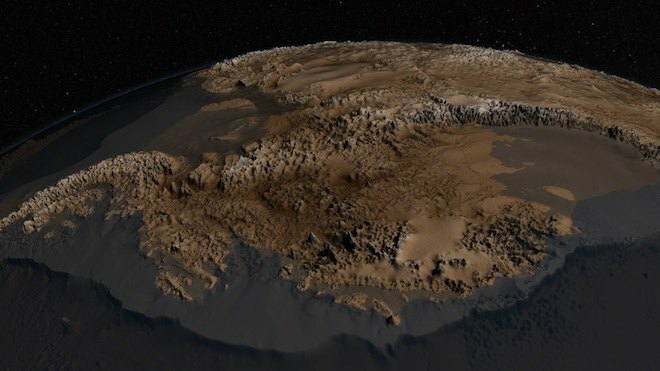 The British Antarctic Survey has revealed the most detailed map yet of the landscape beneath the thick Antarctic ice. The new map is called Bedmap2, and was created with the help of millions of new measurements of the southern continent. The map includes data captured by NASA’s ICESat satellite and an airborne project called Operation IceBridge. By gathering the data and creating the map, researchers will be able to achieve a greater understanding of how Antarctica could be impacted by climate change. As well as the satellite data, specially equipped aircraft flew over Antarctica over a few years to gather radar data measuring changes in the ice, and how thick the ice is in different areas. Looking at the image and the video, I’m amazed just how mountainous Antarctica is. Covered in ice, it looks a lot flatter than it actually is. NASA provides a good comparison slider here, which enables a closer look at the difference. Antarctica must hold a great deal of ice indeed. I hope humanity never gets to see the continent in this “naked” state. There’s no doubting that sea levels would be a lot higher than they are today.